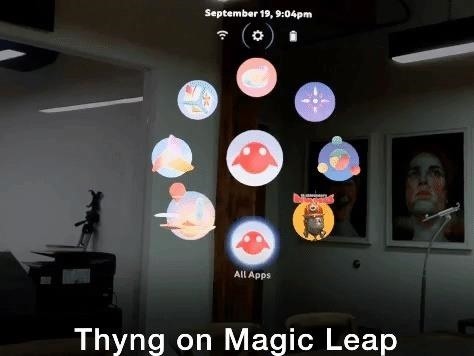 The first mobile augmented reality app out of the gate with support for Magic Leap One Creator Edition is Thyng, who is planning to release the headset version of the app later this year. Available now for iOS and Android using their respective AR toolkits, Thyng enables users to view photos, videos, and 3D models, including their own content, in their physical space. The app also enables creators and brands to create their own AR experiences with image and object recognition by uploading images and 3D files to Thyng's website. "The dream of augmented reality has been for users to be able to share AR experiences across multiple types of devices," said Ed LaHood, CEO of Thyng, in a statement. "With Thyng 5.0, that dream will become a reality, allowing AR experiences to be created and shared across iOS, Android, and Magic Leap devices." While ML1 comes with the Create app for placing interactive 3D content throughout a physical space, Thyng packs a couple of other features that offer tantalizing prospects on the AR headset. Imagine embedding AR content into posters and objects through your home and walking around as AR content bursts forth everywhere. Instead of "Times Square on Acid," you can turn your own home into a psychedelic playground. The app also appears to benefit from the transition. For example, Magic Leap's spatial mapping capabilities allow the app to place content on multiple planes. 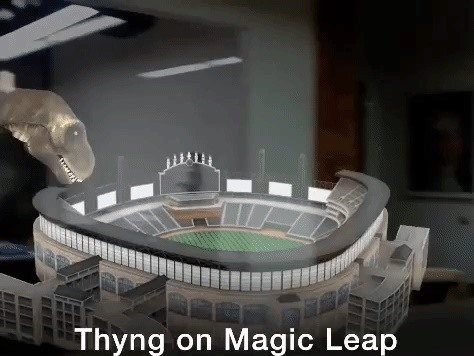 In a demo video, a sports stadium sits on a table, while a Tyrannosaurus rex looms over it from a countertop as a biplane flies overhead. In addition, for those who live in Chicago, the company has a 3D scanning studio in their office, which makes their platform the ideal platform for creating the kind of content tailored for Magic Leap. For instance, in unveiling its partnership with the NBA, Magic Leap revealed the use of a similar studio to bring Shaquille O'Neal into augmented reality. Just days ago, Rovio announced that the adaptation of its hit mobile franchise Angry Birds for Magic Leap, but that game was designed from the ground up for headsets. Thyng, on the other hand, marks the first mobile AR app ported to the headset. Such a precedent is encouraging, but we can't consider it a trend until a few more mobile app developers jump on the bandwagon.